Pages: 230 x 150 mm; 246 pp. 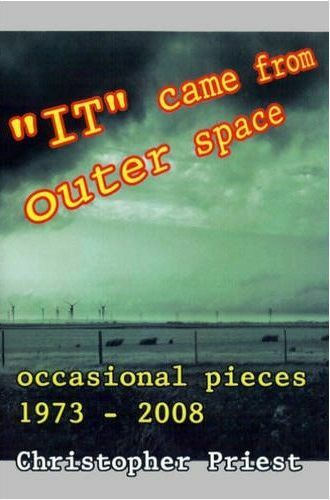 “It” Came from Outer Space is a collection of Chris Priest’s short non-fiction, written over a period of thirty-five years. There’s a wide range of subjects, most of them centred around books: the lives of writers, the deaths of writers, the fascination of slipstream, reviews of novels and other recent releases, two unsolved mysteries from the Second World War (one huge, the other not), a celebration of the life and work of H. G. Wells, and a few discussions of contemporary science fiction, the Cinderella of modern literature. 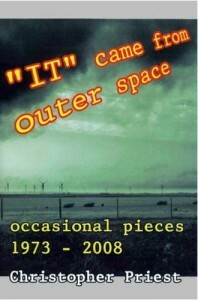 Some of the writers whose books are reviewed or whose work is described are Bob Shaw, Robert Sheckley, Arthur C. Clarke, William Sansom, Richard Cowper, Ian McEwan and Lester del Rey (the victim of the title essay). Subjects include literary plagiarism, nostalgia, reviewers who mistake books for video games, publishers who can’t be bothered to keep your books in print and journalists who can’t be bothered to read them. A few of these articles appeared in newspapers or nationally circulated magazines, but most were written for small-circulation journals or private magazines. This is the first time they have been collected in book form.